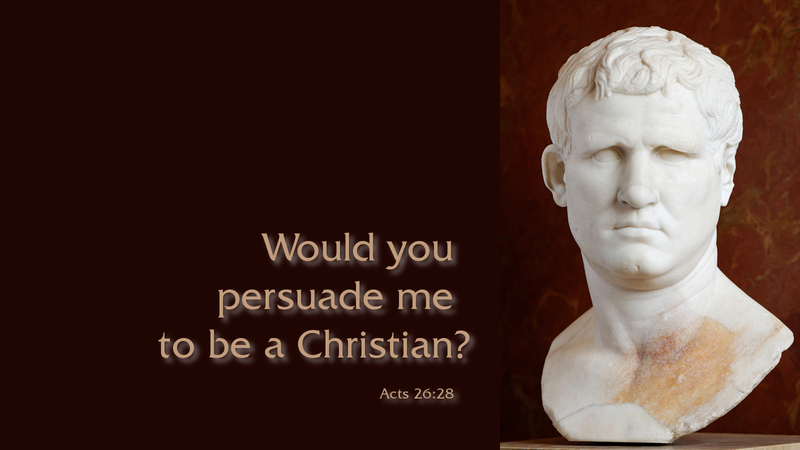 Paul has been telling his faith story before King Agrippa and Festus, governor of Judea. After listening to Paul’s story, Festus could not stand it anymore and interrupted him. Paul’s message of a suffering Messiah was one thing, but to actually believe that he had been put to death by his own people and then raised from the dead as Savior of the world was more than the humanistic mind of the Roman governor could fathom. He decided Paul was crazy. We who believe in Jesus, receive God’s power and wisdom. Consequently, people will think we are crazy at times for believing such “nonsense.” The Holy Spirit gives us power not only to believe, but to proclaim Jesus to those who think we are crazy, and hopefully lead them to faith. Prayer: Give us courage, O God, so that when people think we are crazy, we will continue to witness to them of your incredible love and mercy; in Jesus’ name we pray. Amen.